Companies of all sorts are increasing their investment in AI. Toyota has a wide range of applications of AI, so it’s no surprise that they are interested in helping to spur further growth in the industry by investing in early stage startups that are focused on AI and Machine Learning technology. 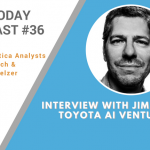 In this podcast, we interview Jim Adler, Founding Managing Director, of Toyota AI Ventures.